Click on the title of each section to see my entire post. 2. I Wish You a Merry QAL! Some of the bloggers that I met in the 2017 New Quilt Blogger Group joined together to form the I Wish You a Merry QAL! quilt along group. This was such a great experience, and I learned so much from these fellow bloggers. The title of this section links you to my first published quilt block: Christmas Tree Farm. My inspiration was our own Christmas tree farm, JANDA Bend Christmas Trees. The pattern is a free download until January 16, 2018. Here is a photo of my completed quilt top which includes all of the 12 designed blocks. 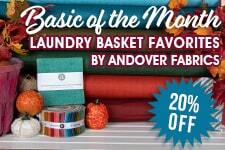 I have included this post because it is a landmark for JANDA Bend Quilts. This post announces the opening of the JANDA Bend Quilts' online store and the completion of my first quilt design offered for sale. Here is a photo of Geese in Flower Pots. You can read more about it by clicking on the title of this section. I participated in two quilt alongs with the Fat Quarter Shop (affiliate link) This post presents my Jolly Bar Jazz quilt. Being a part of quilt alongs with the Fat Quarter shop was exciting! I hope to join more in 2018 as time permits. Below is a photo of my competed quilt. You can read more about my experience by clicking on the title of this section. This year I started my own weekly Linky Party called Pieceful Sunday. Every Sunday, I encourage those who are interested in piecing to link up their in-progress or completed piecing projects. Link ups are now available until the following Saturday. This is the initial post announcing the party. You can read it by clicking on the title for this section. I hope that you will join us! Below is a photo from that initial post. It is the mug rug that I made for the 2017 Teal Mini-Swap. This annual swap raises funds for ovarian cancer research. Pieceful Sunday: Merry Christmas 2017! This week on Pieceful Sunday, I want to wish you all Happy Holidays. May you enjoy the company of family and friends and celebrate the coming New Year. I must say that 2017 has been a rough year for my family because of health issues and the passing of my Father. He was a good man. We all miss him. However, it is a time for new beginnings and looking forward as well as backward. Since this is the holiday season, The Pieceful Sunday Linky Party will be open for links through Saturday, December 30, 2017 at midnight, This way you can link up your quilty gifts after Christmas. I have been working on my Workshop for Beginning Quilters which will be held at the Tahlequah Amory Municipal Center in Tahlequah, Oklahoma. I have already had several people who visited the JANDA Bend Christmas Trees Farm this year indicate that they were interested. The workshop will be open to 24 participants and will include a free pattern to the first 20 people who register. We will be making a version of the pattern Dessert Time from Quilt in a Day. The completed quilt will be approximately 48" x 58". This is a fun, easy pattern that incorporates large half-square triangles and a strip-pieced border. There will be a kit available for sale, or you can purchase your own 10" squares and 2 1/2" strips or make your them from your scraps. There will be a total of six, three-hour workshops on six Saturday mornings (February 10, 17, and 24 and March 10, 17. and 24, 2018). In the first three weeks, you will piece and assemble the quilt top. Then in the last three weeks, you will baste, quilt, and bind your quilt. So if you want to learn how to quilt in 2018 and you live in Northeastern Oklahoma, or Northwestern Arkansas, this is your chance! I have planned additional, more advanced workshops later this year as well. However, I decided to start with the beginner class. Registration Information will be available soon on this web site. So stay tuned! Or better yet, sign-up for the Newsletter so that you do not miss sign-ups! and Beth at Cooking Up Quilts. These three people had a lot to do with my successes in 2017. In this post, I will reflect on the past year and share some of my plans for 2018. 2017: What a Difference a Year Makes! I actually started JANDA Bend Quilts in July, 2016. However, even though I had a web site and a plan, I had not gotten very far by January, 2017. Let's face it. I was a newbie. I needed some guidance. In addition, I designed my first pattern for sale (Geese in Flower Pots), opened my online store, started an online Newsletter, joined Bloglovin, was a guest host for Thanks Goodness It's Finished Friday, started my own Linky Party (Pieceful Sunday), attended Spring Quilt Market, participated in blogger quilt alongs with the Fat Quarter Shop (affiliate link), offered several quilts for sale in the JANDA Bend Christmas Trees Shop, and rented a space to teach a six-week workshop for beginning quilters that starts February 10, 2018. Of course, some of my 2017 plans were not completed, but that is what 2018 is for! Plans for 2018: What comes next? My plans for 2018 fall into several categories. Workshops: I want to conduct workshops throughout the year. I am a Quilt in a Day Certified Teacher. I plan on starting with Quilt in a Day patterns and then teach workshops centered on my own pattern designs. This year I am going to try renting my own space at the Tahlequah Armory in Tahlequah, Oklahoma. The workshop will run for six Saturday mornings in February and March. I am also going to continue to reach out to quilt guilds and quilt shops. Pattern Designs: I want to concentrate on designing patterns this year. I am working on several ideas now. Initially, the patterns will be sold as pdf downloads. Online Stores: I opened my own online store in 2017. However, I would also like to open an online store on Etsy and Craftsy. Both stores would make my products more visible. In addition, I think that the Etsy Store will facilitate International downloads of my patterns. Web site: A web site is always something in progress. This year, I want to reorganize the site so that it is more user friendly. Social Media: Last year, I began to use Instagram, Twitter, and group Facebook pages. I still have a lot to learn. This year, I want to start a JANDA Bend Quilts Facebook page. Quilt Alongs: My I Wish You a Merry Quilt A-Long! group is planning a fall-themed quilt along this year. I plan on participating. In addition, I want to participate in the Fat Quarter Shop's quilt alongs as time permits. Fall Quilt Market and Quilt Festival in Houston: I plan on attending Fall Quilt Market this year and applying to demonstrate my patterns in a class at Fall Quilt Festival. FInally, it is important to me to maintain life balance. My quilty world is important to me, but so are my family, friends, and community. It looks like I have a challenging year ahead, but I love challenges. What about your year? 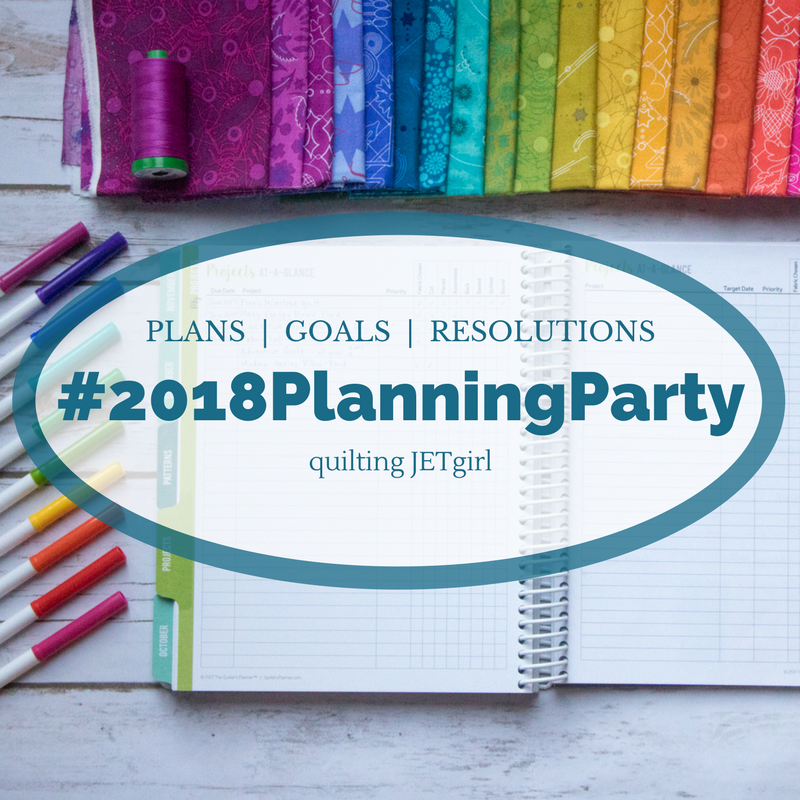 If you want to link up to Yvonne's 2018 Planning Party, click on the link. To see the Pieceful Sunday link-ups or to add your link-up, click on the blue frog button. Last week I wrote about my secret piecing. Well this week I am able to reveal what I was working on. I finished putting together the 12 blocks in the I Wish You a Merry QAL! quilt along! A photo of the quilt top is shown below. You can read about the process of completing this quilt top here. I cannot thank the group enough for their time, generosity, and commitment to our group! We all had a slightly different take on designing and making each block, That added to the fun! It was fun to see the participants' versions of the designs as well. What a creative group! All 12 of the blocks in the I Wish You a Merry Quilt-A-Long are available for free on the designer's web site until January 15, 2018 at midnight. I am offering links to the released block patterns on my Quilt Alongs page until then. Block 12 is here in the I Wish You a Merry Quilt-A-Long, and it is Christmas Lights by Laura Piland of Slice of Pi Quilts. What a fun block! As a host, I am presenting my version of the block and my tips for completing it. Remember that all 12 of the blocks in the I Wish You a Merry Quilt-A-Long are available for free on the designer's web site until January 15, 2018 at midnight. I am offering links to the released block patterns on my Quilt Alongs page until then. Collect them all! Here is my version of Block 12: Christmas Lights. This block uses bias tape to make the wire for the lights and fusible appliques to make the lights and light bases. The first step was to pin the bias tape. Then I chose to sew down the folded edge of the bias tape before fusing the lights. It was fairly easy to form the curve in the bias tape with a hot iron and sew down one edge. See photos below. Then I arranged the light bases and lights and fused them in place with a hot iron using Heat N' Bond. Then I sewed the other edge of the bias tape. Please see photo below. Finally, I sewed around the edges of the the lights and bases with matching thread and a straight stitch. My completed block is shown below. Here are my 12 completed blocks. To read my blog for each one. go to the Quilt Alongs page and click on the JANDA Bend version links..
To see how I put them together in my quilt top go to this post. ​Thanks for a fun block, Laura! Go to Slice of Pi Quilts for the pattern and designer tutorial. What Are the Prizes for Block 12? A big thank you to Make Modern magazine and Sandy Maxfield at Sandy Star Designs! How Do I Enter to WIn the Giveaways for Block 12? Upload a photo of your finished block to the Linky Party at Slice of Pi Quilts . You can ask me in a comment to this post or in an email, or you can ask the designer Slice of Pi Quilts . This is the last block in the Quilt Along! Where Will I Be Able to Find Setting Examples for the 12 Blocks? You can find the setting examples at JANDA Bend Quilts, on I Wish You a Merry Quilt-A-Long Facebook Group, or on any other host's blog. Will There Be Another Quilt Along?